I recently took my Hummer to CarMax for an appraisal, which was carried out by several helpful, perky CarMax employees who clearly thought I was certifiably insane. Yes, ladies and gentlemen, that’s right: I’ve decided to bother the fine people at CarMax once again. And you’d know all about my antics if you followed me on Twitter, because I recently Tweeted an image of my Hummer in front of a CarMax location. Regular readers also know about my CarMax capers because I’ve, uh, had some experience with them before. For instance: last year, I had CarMax appraise my Ferrari. Oh, and there’s the Range Rover I bought from CarMax with a 6-year bumper-to-bumper warranty that’s already paid out $6,500 in claims. But if you don’t know much about CarMax, allow me to provide a little background: it’s a nationwide used car dealer that insists on making the car-buying process easy. You do not go to CarMax if you want to spend four hours haggling over a rear-seat DVD player and VIN etching. You go to CarMax if you want to be offered a bottle of cold water when you walk inside. CarMax also has this service where they say they will buy any car you bring in, even if you don’t buy one of their cars. That’s right: they say they’ll buy any car, whether it’s a bus, or a van, or a recreational vehicle, or a Chevy Lumina, or something with a salvage title, or a vehicle that’s been serving as a home to a wild raccoon colony since the Bush years. Any car. So I walked into the dealership and I was greeted by a helpful sales associate named Ray, who informed me that he would begin the process by going over a few details with me. He also took my Hummer key, which is just a fairly generic key with “WAL-MART” emblazoned on it. This came up later when he asked if I had “the spare key for the vehicle,” and I informed him that no, I do not, but I would be happy to head down to the local Wal-Mart and get one made. Ray did not find this as funny as I did. Next, Ray asked about various features, and options, and equipment present in the vehicle. The answer to all these questions was no. Then the actual appraisers came out to do a walkaround of the vehicle. Now, I figured at this point I would have these guys stumped. I figured they must spend every day appraising GMC Acadias and Honda Accords, so they would have absolutely no idea what to with a 20-year-old military-style Hummer, and maybe they would accidentally way over-value the thing, or at least refuse to drive it on account of the fact that it is approximately the same size as an NBA stadium. But this is where my plan backfired. “Have you driven one of these before?” I jokingly asked, thinking there was no way someone had ever brought a Hummer into CarMax for an appraisal. “Not since we used them as transport,” one of the appraisers replied. As it turned out, both appraisers had been in the military. Not only that, but they had driven Hummers before. Not only that, but they had spent more time behind the wheel of a Hummer than I had. “So you know how bad it is,” I said. The problem was, they knew exactly what to look for. They knew how to find the inboard brakes, how to shift into low-range gear, and what spots under the body would be most prone to rusting. I knew I was screwed when they walked up to the hood – which is held down by two large, intimidating exterior latches – and unlatched it with the same casual demeanor you or I might use to open a tube of toothpaste. Next, we all piled inside the Hummer – me, Ray, and the two CarMax appraisers – and we went for a drive. Normal CarMax appraisers probably would’ve been intimidated, but these guys treated it like it was nothing. They were probably just happy they weren’t taking enemy fire. The only sore point of the appraisal process came when we got back to the dealer and one of the appraisers noted that, while the undercarriage and frame of the truck looked pretty clean, there was some rust on the roof and body. I politely informed him that this is impossible because the Hummer’s body is made of aluminum, which cannot rust. He nodded patiently, and gave me the kind of look you give a 9-year-old when he tells you that someday he’s going to grow up to be the president. So I went inside and waited for the appraisal. Now, at this point, we should do a little tutorial on Hummer values so you know exactly what to expect. Although some trucks easily cost $100,000 or more, many are in the $40,000 to $60,000 range. Mine is below that: due to its age and condition, I think its retail value is around $25,000 to $30,000. 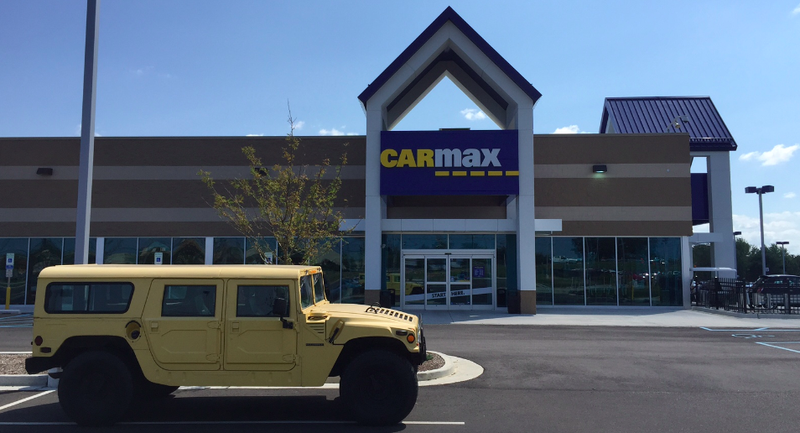 But CarMax doesn’t deal in “retail value” for 20-year-old military-style Hummers. In fact, CarMax doesn’t even deal in wholesale value. Due to CarMax policies, they don’t sell anything this exotic or this old – and that means they’ll offer below wholesale so they can take it to the auction and make a little money on the whole thing. A good example is my Ferrari appraisal, which came back at $64,000, even though I sold it a few weeks later for $78,000. For the Hummer, I predicted they’d offer me twelve grand. Unfortunately, the offer wasn’t immediately forthcoming. Usually this process takes about five minutes: they check auction data. They check retail listings. Then they offer you just enough to convince you that it’s better than selling the car yourself. But for the Hummer, it was taking forever. Ten minutes went by. Another ten minutes. Eventually one of the appraisers came out and admitted to me it had taken so long because they had to call a wholesaler who deals with “cars like this,” but they were finally ready for me. So I went back, and Ray had this look on his face like I had asked him to watch my tropical fish collection while I was on vacation and he had accidentally eaten one of them. “Oh, so you want to sell it?” Ray replied, excitedly. And then I asked him for a printout of my offer. And this, ladies and gentlemen, has been my latest experience with the good folks at CarMax. They were very nice, and courteous, and professional, and surprisingly generous. And I’m sure I won’t be using their services again for at least a few days, when the next thing breaks in my Range Rover.